Cologne is one of Germany’s top shopping locations. Whether it’s a trip to the busy stores in the pedestrian zones of Schildergasse and Hohe Straße, a meander through the exclusive boutiques of Mittelstraße and the adjoining streets, or a wander into the trendy Belgian Quarter – you can be sure of finding a pleasure packed shopping experience for every budget and plenty of opportunity to return home packed with purchases. A shopping day in Cologne often begins on Hohe Straße, which starts right at the cathedral and was once part of the ancient road linking Rome and Xanten. In the 1960s, it became one of Germany’s first pedestrian precincts and today offers a dense mix of well-known fashion chains, shoe stores, jewelers, shops for cosmetics, home furnishings and consumer electronics along approximately half a mile. Hohe Straße runs into Schildergasse, a broader pedestrianized thoroughfare, whose reputation for shopping extends far beyond the city walls. It frequently takes the title of Germany’s busiest shopping street. Besides a wide variety of stores, Schildergasse – which is named after the painters of heraldic shields who traditionally resided here – also features some sparkling architecture – the Weltstadthaus, designed by star architect Renzo Piano and home to the German fashion chain Peek & Cloppenburg. This building has a form not unlike a stranded whale and was soon dubbed the “Walfisch” by the Cologne people following its opening in 2005. Situated at the apex of Hohe Straße and Schildergasse is Galeria Kaufhof. Boasting 31,000 square meters of sales floor, it is Cologne’s largest department store and the second-largest in Germany. On the far side of Neumarkt, only a few minutes stroll from Schildergasse, are Mittelstraße and the adjoining streets like Pfeilstraße, Benesisstraße or Apostelnstraße. Back in the 1940’s, this part of Cologne was home to small artisan businesses. Today, it boasts more than 150 shops selling high-class fashion, premium accessories, shoes and jewelry. One of Mittelstraße’s main shopping attractions is “Apropros – The Concept Store”, Cologne’s premier address for luxury goods. Entered via a 25-metre-long pink tunnel, this establishment is a paradise for lovers of exclusive international brands. Other nearby streets also boast a fine selection of designer goods, dotted among small boutiques offering extravagant fashion and accessories. Furthermore there are a number of excellent antique and fine art shops. Neumarkt, a sizeable square in central Cologne, is home to a number of large specialist shops selling goods such as furniture, lighting and photographic equipment. Nearby is the Neumarkt Galerie, recognizable from afar by a huge inverted ice-cream cone on its roof, the work of pop artist Claes Oldenburg. This mall is fronted by a major branch of the book chain Mayersche Buchhandlung. Just a few steps around the corner are the department store Karstadt and outdoor pursuits store Globetrotter with four floors of top-quality goods. 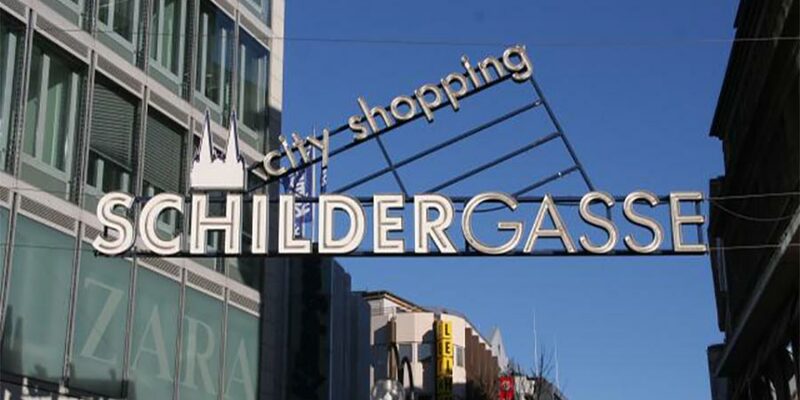 Finally, shoppers looking for stylish home furnishings are well advised to head for the so called “Ringe” between Zülpicher Platz and Hansaring, where a variety of stores offer furniture, beds and home accessories. With its vibrant mix of trendy fashion shops, shoe stores and cafés, Ehrenstraße and Breite Straße have become a magnet for the younger crowd. Their attractions also include smaller branches of the major chains and a whole variety of specialist shops selling things like high-class eyewear, art books and artisanal pastries. Those in need of a quick snack have a broad choice for every taste. Shoppers in search of something different and quieter should pay a visit to Cologne’s Belgian Quarter. Beyond the bustle of the big city, this quarter exudes a creative ambience and a relaxed atmosphere in which to shop at leisure. Named after Belgian cities and regions, its streets are increasingly home to Cologne’s top creative figures. More and more designers, both well-known and new coming ones, have opened up boutiques offering distinctive and high-quality fashion beyond the mainstream – often as organic or fair-trade products. Recognized names include the designer Herr von Eden with his sophisticated men’s collections and Fenja Ludwig, who designs avant-garde fashions under the “Ludvik” label. Fans of unique and exclusive handmade jewelry will find choice examples of this craft in the many workshops dotted throughout the quarter, such as the “Goldschmiede Götten” or the studio of jewelry designer Karl. The quarter’s numerous cafés, bars and restaurants also contribute to the special charm of the Belgian Quarter. Here is an ideal place to relax after a successful shopping spree. Interested in learning more about Cologne?